Kay and I have just returned from a few days in Arizona, where we watched the spring training activities of our beloved (and frustrating) Texas Rangers. We loved seeing the games in a stadium that put us "up close and personal" to the players. I took Kay to the Ranger complex and explained some of the nuances of the drills the players were going through. It gave me a chance to show off. I'd been where they were, I knew what was going on. It brought back memories, good ones. The day we were scheduled to leave, we watched the major league team go through their stretching and limbering up exercises. The players took the activities seriously, and for a good reason. A pulled hamstring can put you out of action for a couple of weeks--long enough to lose your chance to make the team. If you don't think being out for just a little while can make a difference, consider the case of Wally Pipp. 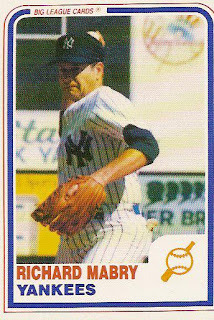 He was the first baseman for the New York Yankees years ago. He was out for a day, and a young player named Lou Gehrig took his place. Yes, that Lou Gehrig--called "The Iron Horse" because he played so many consecutive games. Preparation is important, and being ready when called upon is everything when you're trying to make the team. The major league and minor league players work out in the same complex, but in different groups, although sometimes the big league team pulls minor leaguers in to serve as extra bodies. These are the guys who play the last couple or three innings of the spring training games while the regulars are in the clubhouse showering and making tee times for their golf games. It's a thrill for these minor leaguers to be included in that way, but, as we pulled away from the complex for the last time, Kay and I talked about how we sympathized with them. Maybe one or two would actually make the big league squad, but the rest would go back to the minors. Most of them would never make it to the majors. But they keep trying. A career in professional baseball offers three paths: keep on plugging until you make it to the big leagues, keep working hard at your craft even though you never get out of the minor leagues, or decide that it's just not worth the effort and pack it in. It doesn't take a genius to translate these choices to those facing the person who wishes to be a writer. You can pour everything you have into your writing, taking your preparation seriously, improving your craft, being ready for that big break. You can keep trying, even when you finally realize you may never have anything published, because you love what you're doing. Or you can eventually decide that, for whatever reason, it's time to give up the dream. Lest you think I'm being critical of the third group, think again. Whether you're playing baseball or writing, even if you have to move on to other things, you'll always have the experience and the memories. They will have changed your life. I hope that the change is for the better. It was for me. 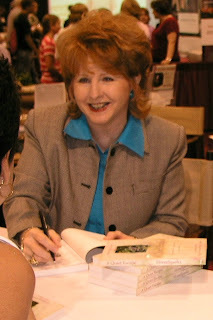 I’m pleased to have Kristy Dykes as the second of my “all-redhead, all-the-time” blog guests. Her last book was Kiss the Bride. 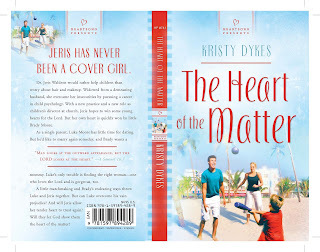 Her latest book, The Heart of the Matter, is due out next month, and I thought this would be a good opportunity to get to know Kristy better. RM: Newspaper columnist, speaker, author—which came first, and how did you get to this place in your career? KD: They all kind of "hit" me as I walked in God's will. Oh, and add to that a call to the ministry. As far as writing, I felt a special calling from the Lord when I was in my 20s and wanted to get a degree in journalism but couldn't due to my busy schedule as a pastor's wife. So I studied armloads of books on how to get published, sat down and wrote articles, and started getting published. I stopped counting them at 600. They include sales to two New York Times' subsidiaries, Guideposts, and a weekly cooking column which made me gain weight! ☺ (Along the way, I got my heart's desire and earned a degree in mass communications/journalism.) Having always loved reading novels, that segued into wanting to write and publish them. So I hit the books again because nonfiction is a whole different ballgame from fiction. I studied both novels and craft books, and I attended scores of fiction writing classes (one was a weekly college fiction-writing class I consistently attended for four years which was taught by a multi-published author). Now, I have 10 titles sold, with many more in my heart that I believe are going to come forth. RM: Your genre is Christian romance fiction. Why have you chosen that, as opposed to, say, suspense fiction? KD: Everybody loves a love story, as the saying goes, including me. I'm a romantic nostalgist, or is that a nostalgic romanticist? My unpubbed books are women's fiction with strong romantic elements. My pubbed ones are in the romance genre except for one—my novella, "Reunited," in the 4-in-1 Wedded Bliss?, which won Third Place in the 2006 Book of the Year Contest (contemporary novella category), presented by American Christian Fiction Writers. "Reunited" could be put in the above classification: "women's fiction with strong romantic elements." RM: Your husband, Milton, seems to be very supportive of your writing. Does having a pastor husband affect your work one way or another? KD: All through our pastoral ministry at several churches, he's said things like, “We need someone to teach children's church. Will you do it?” Or, “We need a Sunday school teacher for the teenagers' class.” Or, “We need to start a young married couples' class.” Yes to playing the organ, serving as youth pastor, being the church secretary, directing women's ministries—I've worked in every area of church life except men's ministries, and I've cleaned enough church commodes and changed enough diapers to last a lifetime! I joke that instead of having 1.2 million books under my belt, I have 1.2 acts of kindness. ☺ When I started pursuing writing and publishing fiction, he said, "You've helped me so much in the ministry, that now I'm going to help you." He goes with me to writers' conferences, International Christian Retail Shows, Christy Awards banquets, book signings, and speaking engagements, and he cheerfully agrees to spend all the money these things entail. He encourages me when I doubt myself. Every one of my books has this dedication: "To my hero husband Milton who is my collaborator in the deepest sense of the word—he's believed in me, supported me, and cheered me on in my calling to inspirational writing." RM: If you couldn’t live in Florida, where would you like to live, and why? KD: There are more states in the U.S.? ☺ I'm a native Floridian and proud of it. Generations of my forbears are natives, and that's a rarity since we have so many transplants moving here to enjoy our gorgeous weather. We lived in Alabama for our pastoral ministry, plus my husband's from there, so that would be nice. Alabamians are wonderful people with gracious Southern hospitality. RM: Tell us about your next book, The Heart of the Matter. KD: It will be published April, 2007, by Heartsong Presents, a division of Barbour Publishing. It's a contemporary with a slight echoing of Pride and Prejudice because the hero and heroine are full of pride and prejudice. Blurb: "A woman with a problem...a man with a prejudice...a child with the answer." Scriptural theme: "Man looks at the outward appearance, but the Lord looks at the heart" (1 Samuel 16:7). First and second lines: “I want everybody to pray that God will give me a mommy,” little Brady said in a heart-tugging, grown-up way. Luke Moore took a deep gulp as he sat in the church pew and stared at his six-year-old son—the boy who'd just made the prayer request. RM: And finally, any words of wisdom for fledgling, unpublished writers? KD: Somebody said, "People don't fail; they quit." I made up my mind I was not going to quit. I would see my dream come true. I love to challenge people to strive for their dream, and I even have a dream talk and a dream article entitled, "Your Dream Is Doable—If You'll Pay Your Do's (Misspelling Intended)." It's been published a myriad of times. In a nutshell, it says: 1. Do everything you know to do and do it diligently (Ecclesiastes 9:10). Study, grow, glean from others. 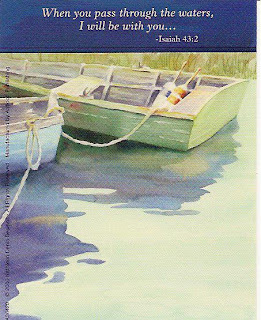 2) Do rest in your call (1 Thessalonians 5:24). Remember, it is the Lord who called you, and He is the one who will bring it about—in His timing. 3) Do not want "it" above the Lord (Matthew 6:33). Don't get so caught up in your dream that you lose sight of the Dream Giver. 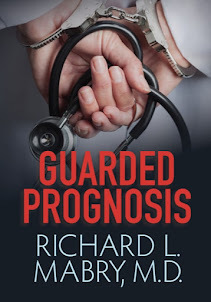 Thanks, Dr. Richard, for interviewing me. I'm honored. I loved your questions. They brought out a lot. I'd love to hear from your readers at my site, ChristianLoveStories.blogspot.com. RM: Thank you, Kristy. 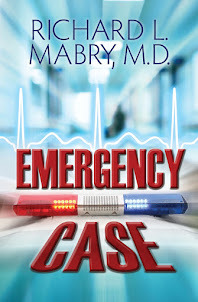 I would encourage my readers to check out your site, including the "Dr. Richard Mabry" love story you've posted. In two weeks, I'll be posting the next in my "all-redheads, all-the-time" series of interviews. Watch for it. I never really thought much about the value, either monetary or sentimental, of signed copies of a book. Now autographed baseballs and such--that's another story. As I sit here at my desk I look up at the wall and smile at a picture of three guys in New York Yankee uniforms: Mickey Mantle, Whitey Ford, and me. Mickey and Whitey signed the picture, and it's one of my most prized possessions. Not because of the monetary worth of the signatures, but because of the sentiment behind it. Since I have become seriously involved with writing, it's been my privilege to make the acquaintance of a number of folks in the profession. These authors and editors are really neat people, and the opportunity to get to know them a bit better is one of the nicest benefits of what I'm doing. And now I have a real appreciation for signed copies of their books because of the personal connection I have with them. During all this, I've even become pen pals (or the email equivalent thereof) with a few authors outside the field of Christian writing. One of these men is Dr. Michael Palmer. Michael has practiced extensively in internal medicine and emergency medicine, and is now an Assistant Administrator with the Massachusetts Medical Society. 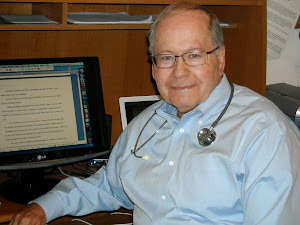 His medical suspense novels are at the top of my list of favorites, and I've enjoyed our email correspondence. Recently he offered to make available signed bookplates to people who have purchased any of his novels. He was kind enough to send me one, and when I remarked on how neat the idea was, he sent me the name of his source. Now I'm prepared to make signed bookplates available to those of you who have unsigned copies of my book, The Tender Scar: Life After The Death Of A Spouse. If you would like a signed bookplate like the one in the picture, just email me at DrRLMabry@yahoo.com and give me your address, tell me how many bookplates you need, and indicate any personalization you'd like. No charge, no obligation. Just something I'd like to do, now that I know how much more meaningful a personalized book can be. 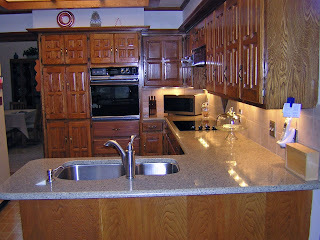 We have just finished remodeling our kitchen. Little did I know, when I told Kay that we should go ahead with the project, that it would be this complicated. I won't go into detail. It would bore you and make me cry. Let's just say that it took about twice as long as we expected, cost almost twice as much as I thought--and the end result is so nice that I wish we'd done it years ago. How many times have you put off doing something, only to realize, after it was done, that you should have done it much earlier? You see the final product, recognize the fruit of your labor, and wish you'd gone ahead long ago. In our case, we knew that we'd have to modernize the kitchen before even thinking about selling our house. (No, kids, we're not moving. Just planning for that "someday" down the road). That's when I said, "We should do it now. Let's don't spend the money and put forth the effort so that somebody else can enjoy it. Let's do it for us." So we did, and I'm glad. I had the privilege of knowing Mickey Mantle. At the last baseball fantasy camp I attended, Mickey hit what would prove to be his last home run. It was a highly emotional moment for everyone there, and since I was in the first base coaching box, I got to shake his hand when he shuffled around the base. Mickey found Christ before he died, but I keep wondering what kind of influence he could have had if he had done this much earlier in his life. His testimony could have reached untold thousands who might not otherwise pay any attention to the call of Christ. And, like us with our kitchen, Mickey could have experienced the joy of redemption and renewal while there was really time to enjoy it. 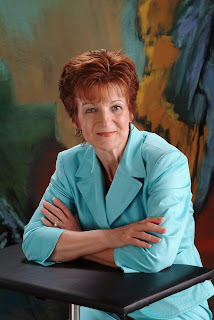 Today I’m devoting my blog space to an interview with a fellow Texan, writer DiAnn Mills. DiAnn and I first met in the coffee wagon line early one rainy morning at Mt. Hermon. 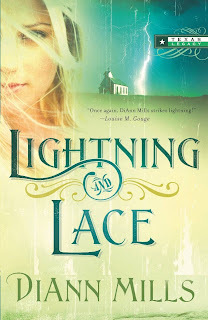 Her latest novel in the Texas Legacy Series is Lightning and Lace. I appreciate DiAnn giving us a few minutes to share her insights in writing. RM: How old were you when you began writing? DM: Actually I was in the second grade. I wrote poetry and stories. Then I remember filling up a Big Chief pad with my first book - a western. I don’t remember what happened in the story except the hero always rode off into the west at the end of each chapter. I imagine it resembled Wagon Train, since that was my favorite TV show at the time. My goodness, I hope some of your readers know that classic! RM: Well, I certainly remember it, although I’m surprised that you’re old enough to recall it, as well. What is the most important aspect of your writing? DM: Without a doubt, it is characterization. I’m a character-driven writer, and that means my goal is to write real “people” who react and respond to the events and happenings in their lives according to their traits. When you consider how long we have lived to develop our character, then you have an idea the formidable job a writer has in developing credible, colorful, and compelling characters. Characterization drives plot. Stop for a moment to consider your favorite books or movies. The plot may have intricate twists and turns, but it’s the characters who become unforgettable. RM: As another writer of character-driven fiction, I agree. DM: ☺ That’s like asking a mother which child is her favorite! I enjoy writing historicals because of the romance of an older era. The obstacles that stood in the way of these people bred courage and strength into their lives. Their problems weren’t any different than the ones we face today, but how the characters solved them presents an intriguing writing project for me. I enjoy writing a contemporary because it is who we are today. Our lives are fast-paced and stressful. We are courted by TV, movies, magazines, and newspapers. Every headline, every magazine article, every viewed program sparks ideas of how a character could handle a problem. I thrive on suspense and the challenges of a protagonist who lives his/her life from a Christian point of view. I’ve never tackled sci-fi, fantasy, children, or speculative. But who knows? RM: What part of the writing process is your favorite? DM: I don’t think I have a favorite because the process all builds to a finished project: a novel that inspires and entertains. I’ve already stated how I feel about characterization. Plotting is an extension of characterization. The actual breakout of words on paper and seeing the story come to life thrills me. Editing to make my novel the best. Marketing and networking is an opportunity to promote the story God has given me and to make new friends. RM: What part of the writing process is your least favorite? DM: The scary part. When the book is released. I think of it like a mom who sends her precious child to the first day of school. She wants the child to behave and have everyone love him/her, but what if the child comes home with a note that says the child was naughty? RM: We all know that it’s not enough just to get that first contract, although it’s the immediate goal of the fledgling writer. What do you feel is the key to continuous publication? DM: I’d say it is a mixture of things. Striving to always make the next project better than the previous. Bathing the project with prayer. Listening for the voice of God. And, for me, mentoring new writers. I love to help someone achieve their writing goals. RM: I hear you and other writers use the word “passion” when you speak about writing. What does that mean to you? DM: Passion in writing involves a number of aspects. At least it does for me. Passion for writing is like telling a pastor to preach his best sermon, a singer to sing his favorite song, a dancer to reenact the finest performance, or an artist to transfer a dream onto canvas. Many times a writer has this type of feeling or a passion for a topic or story idea. The writer cannot not write it. RM: Excellent advice to those who are tempted to write to please an editor instead of writing their passion. How do you feel about critique partners? DM: Mine are fantastic. I like another set of eyes to read my work critically. I want to know if it works and what doesn’t. Are the characters real? Is the plot believable? Does the dialogue seem to lift off the page? And have I added the right amount of sensory perception. RM: Where did you get your inspiration for The Texas Legacy Series? DM: For years I had this idea about a lady outlaw who decides that she’s had enough and leaves the gang. Along the way, she finds the Lord, but the guilt and shame of her past plague her journey. That was Leather and Lace. In the writing of the first book, I realized the hero had a brother and sister. Each one had a story that begged to be told. Lanterns and Lace is about the younger brother, a doctor who adopts an infant from a dying prostitute. Lightning and Lace is about the sister who is forced to face life as a widow and runs head-on into a man who is attempting to live down a troubled past. RM: What tips can you give new writers? Establish a time and stick to it. Read your genre and out of your genre. Be diligent to the craft. Thanks, DiAnn, for sharing. If you’d like to know more about DiAnn, including an opportunity to see a sample from Lightning and Lace, visit her web site. Keep tuning in. In addition to my Random Jottings, I have some more author interviews lined up, and I think you’ll enjoy them. I’ll give you a hint. The interviews will be “all-redheads, all the time” for a while. You may be asking what this picture is all about. Well, it's me, staring at my computer screen, willing words to appear on it. That's where I do all my work now. No more yellow legal pad. No more Royal Selectric typewriter. Nowadays, it's computers all the time. There has been a good deal of back-and-forth on some of the blogs lately about tools for writing. Much of it has to do with the writer's preference for a PC or a Mac. My very first computer was one I purchased for my medical office. It was an IBM clone, manufactured by a one-man company here in Dallas. I bought it and an instruction manual (long before the days of the ... For Dummies books) and put it on the desk with instructions to my secretary to learn how to use it. Of course, I had to become familiar with it, as well, but those were the days of typing commands into a PC from the DOS prompt--practically prehistoric in view of modern technology--so I quickly opted for a Mac when I bought my first personal computer. And I've never really regretted it, although I did mumble a few words under my breath about Steve Jobs until Apple finally came out with the OS X operating system. Be that as it may, the big question for writers is, "How do you back up your work?" 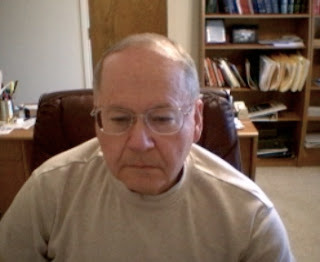 There are numerous programs available to do just that, for users of both types of computers. Then there's the expedient of emailing your work to yourself (or someone else) and letting it be stored on your internet service provider's server. Flash drives now allow storage of up to two gigbytes of information on a small gadget that's about half the size of a business card. Finally, there's the option of using a second hard drive, either mirroring your basic drive or using it as a back-up destination on a periodic basis. My point is not so much that there are lots of ways to back up data from your computer. It's that it is mandatory to do just that on a regular basis. This goes not only for writers and other creative souls, but for anyone whose computer contains data that cannot be lost without a great deal of weeping, wailing, and gnashing of teeth. Case in point: My iBook laptop was running a bit slow, so I made an appointment at the local Apple Store with one of their "geniuses." Now these aren't really Einstein clones, they're just men and women (most of whom look to me as though they're not old enough to vote) who have a great deal of computer knowledge. The young man who began fiddling with my laptop said, "Oh, you've got lots of old stuff on here." He began deleting things right and left, and by the time I left the store my system was as frisky as a young colt. Only one problem--he'd deleted an older version of the utility, Quicken, that I use for my banking records, leaving me with a hole in my data. Fortunately, between the ability to download information from my bank and the backup data I'd accumulated, I was able to restore it. But if I hadn't...well, you get the picture. Recently, a well-known author friend suffered a computer crash. All her work was backed up, but she lost the jpeg files with all the covers of her previous books. On the ACFW loop today, someone was asking for help in restoring lost data. It's not an uncommon situation. You always think it will happen to the other guy. But, just in case it happens to you, I urge you to pick a method and regularly back up your work. Someday you'll be glad you did. Now where did I put that flash drive with the latest version of my WIP?